A fund has been started to help legendary hacker John Draper, aka Captain Crunch, recover after a long stay in hospital. Mr Draper was in hospital getting treatment for a variety of age-related medical conditions. 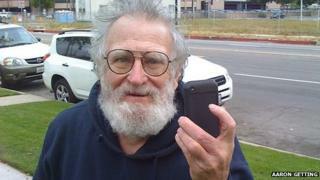 Now 71, he was one of the first "phone phreaks" who hacked US phone networks. Most famously, Mr Draper told Steve Wozniak and Steve Jobs about phone hacking which helped them generate cash to found Apple. The campaign on Qikfunder is aiming to raise $5,000 (£3,000) to help pay Mr Draper's day-to-day costs while he recovers. The fund was started, said the page, so he could focus on getting better. So far, it is not clear who started the funding drive as the page only credits unnamed "friends". Qikfunder is a relative newcomer to the crowdfunding world and a small number of campaigns have been run through it. On Twitter, Mr Draper thanked from "the bottom of my heart" the people who set up the fund-raising account. So far, about 25% of the target total has been raised. Mr Draper's age and a degenerative spine condition landed him in hospital in mid-August where he underwent surgery twice to tackle his back problem. Complications after surgery meant he was in hospital for a month. Mr Draper got the name of Captain Crunch because he found out that a toy whistle given away with the cereal of the same name generated a tone at a frequency that controlled some functions on AT&T's phone network. Experimenting with the whistle led Mr Draper to develop an electronic "blue box" that could generate other tones which, when played down a phone line, gave owners limited control over the US phone networks. Many people used the boxes to get free phone calls. Mr Wozniak and Mr Jobs learned the secrets of "phone phreaking" from Mr Draper and started a business selling blue boxes to college students. Once Apple was founded, Mr Draper was regularly used as a software programmer and worked on ways to connect early Apple machines to phones and on the EasyWriter word processing program. After leaving Apple's employ, he spent many years working in Silicon Valley and elsewhere in California at a variety of established tech firms and start-ups. Update 29 September, 2014: The Qikfunder campaign surpassed its goal at the weekend. More than $6,900 has been raised, but the site is set to continue accepting donations for another 52 days. On Sunday, Mr Draper took part in a Reddit "ask me anything" chat, in which he revealed he was also hoping to raise money to pay for a professional writer to help with his memoirs.